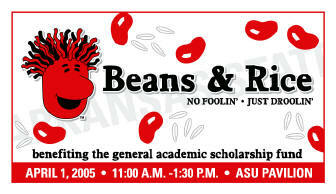 March 17, 2005 -- To allow more deserving students a chance at a college education, the Office of University Development at Arkansas State University is hosting “RED” beans and rice, a lunch on April 1, 2005, to benefit the General Academic Scholarship Fund. Music, an appearance by RED, ASU’s spirit character, and door prize giveaways will highlight the event. More information and a list of prizes can be found at http://support.astate.edu. Tickets are $5 in advance and may be purchased by calling University Development at (870) 972-3940, or by visiting the office in Room 103 of the Administration Building. Tickets will be $6 the day of the event, which will be held at the ASU pavilion. The dinner will include red beans, smoked sausage and rice, cornbread, a dessert and drink; carry out will be available. Sponsors for the event include WRFoods, Riceland Foods, Sodexho, Tabasco, Food Giant, PepsiAmericas and the Design Shoppe. “The ‘RED’ beans and rice lunch is a way for friends of the ASU Foundation to come together and enjoy good food, great company and contribute to a meaningful cause,” Watkins said.